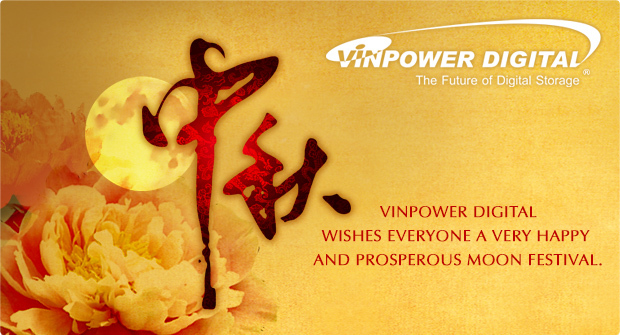 Vinpower Digital wishes everyone a very happy and prosperous Moon Festival. Holidays are times to be cherished and celebrated and this Sunday, September 27th many will celebrate the Mid-Autumn Festival otherwise known as the Moon Festival. We wanted to let everyone know that the Monday following the holiday, (September 28th), the Vinpower Taiwan and China offices will be closed in celebration of the Chinese Moon Festival Holiday. The US and EMEA offices will continue to operate during normal hours during this time, so if you should have a question, you may contact those offices during the holiday. Thank you for your support and patronage and for those celebrating the Moon Festival, we wish you joy and good fortune! 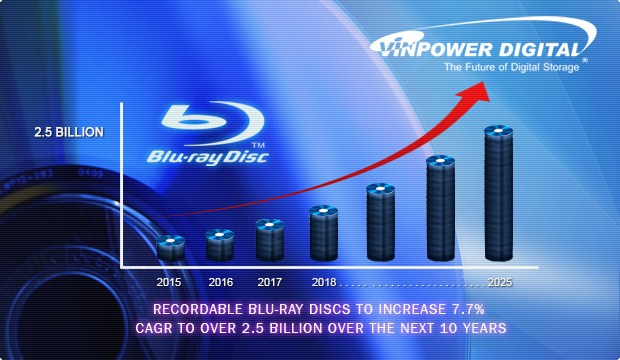 According to a study by Future Markets Insights (FMI), recordable Blu-ray discs sales will increase by a 7.7% compound annual growth rate (CAGR) from 2015 to 2025, for a cumulative volume of over 2.5 billion recordable BD discs sold annually. Currently, recordable Blu-ray discs account for 13% of the recordable optical disc market. That percentage is certain to grow and the primary factors fuelling the demand for recordable Blu-ray discs include an increasing demand for high volume storage discs and content protection against piracy. Vinpower has been focused on both of these elements for many years as we anticipated this shift years ago. As content becomes larger and the amount of the content also grows, the most efficient and inexpensive method for storing and disseminating that content is through Blu-ray optical discs. We mentioned many times how major companies like Sony, Panasonic, etc. are constantly looking at ways to expand the storage capacity of optical discs, to where a single disc holding a 1TB of data is not far fetch. Now that 4K Ultra HD content is rolling out to the public, the need to 60GB+ to 100GB+ is going to become as common as the 25GB BD-R, dropping the price and making them more affordable for the average consumer. 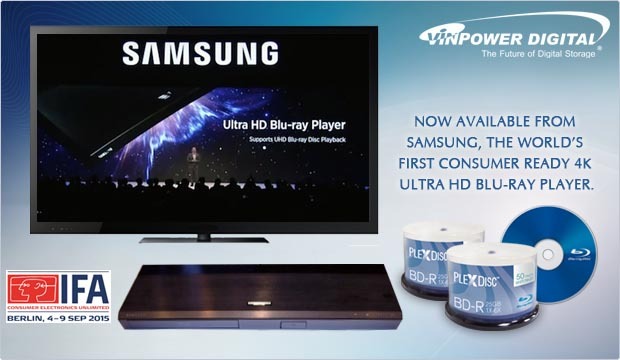 So if you want to ride the Blu-ray wave of opportunity, contact Vinpower or a Vinpower representative today for more details about our line of Blu-ray media and hardware. It was only a matter of time before it happened, but Samsung beat everyone else to the punch and announced the worldâ€™s 1st consumer ready 4K Ultra HD Blu-ray player at the IFA trade show in Berlin, Germany this past week. A number of TV manufactures have already created 4K capable televisions, but Samsung has taken the next step and mirrored the 4k Ultra BD player to have a curved front bezel to match the curved appearance of their 4K TVâ€™s, given them both a more uniform look. Previously, 4K content was limited, mostly because there werenâ€™t any available players. Now, with the introduction of the Samsung 4K Ultra HD Blu-ray player, to be named the UBS-K8500, scheduled to be commercially available in 2016, the content will come. In fact, 20th Century Fox has already announced that they will be releasing 4K titles for the Samsung player and the many other players that are soon to enter the market. This is just another example of how optical discs will continue to be an integral element of our entertainment experience and will be relevant for many more years to come. In fact, itâ€™s understood that the Blu-ray Disc Association will approve a new 66GB DL disc to handle the larger 4k format capacity. So donâ€™t throw out your DVD or Blu-ray movie collection and keep creating content on optical discs, because there will still be optical disc players and there will still be consumers looking for optical disc content to play on them. As these files get larger and larger, it will be harder to stream and still capture the true imagery and sound embedded on the Ultra HD BD discs, so if you want the full experience, optical discs are the best option. For more details about Vinpower Digital or the products we offer, please contact a Vinpower representative or reseller, and they will be more than happy to assist you. 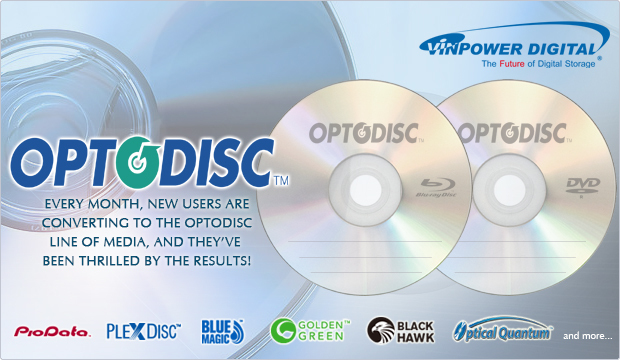 Every month, new users are converting to the OptoDisc line of media, and theyâ€™ve been thrilled by the results! Vinpower introduced its line of OptoDisc recordable media over a year ago and it has been an amazingly successful venture. The main reason is the media simply and consistently performed and users have been very happy with the results. As our C.E.O., Calvin Chang, proclaimed, â€œWhen people use OptoDisc media in their duplicators and/or disc printers, the media burns and prints successfully time and time again. When they use the recorded OptoDisc media in their players, it plays consistently. Basically, the media performs the way itâ€™s supposed to and each batch works exactly the same as the previous batch and the batch before that.â€ Vinpower has been adamant about maintaining both the media quality and the consistency across all manufactured lots. So if youâ€™re happy with the performance, youâ€™ll continue to be happy as the media will continue to work in the same manner every time you buy it. OptoDisc is not a brand itself, but a manufactured media that is the basis for a number of popular brands currently on the market. To find out if your media is OptoDisc manufactured, look for the OptoDisc MID or contact a Vinpower representative to learn which brands are made from OptoDisc. If you havenâ€™t had the opportunity to try OptoDisc media for yourself, contact a Vinpower representative today to see how much OptoDisc can save you.